To Cite: Mortazavi S J, Kalantar S H, Dehghani Firoozabadi M, Panahi S, Ramezanpoor Asl A. Open Periprosthetic Patella Fracture Around Knee Endoprosthesis: A Unique Case Report, J Orthop Spine Trauma. 2017 ; 3(2):e62532. doi: 10.5812/jost.62532. 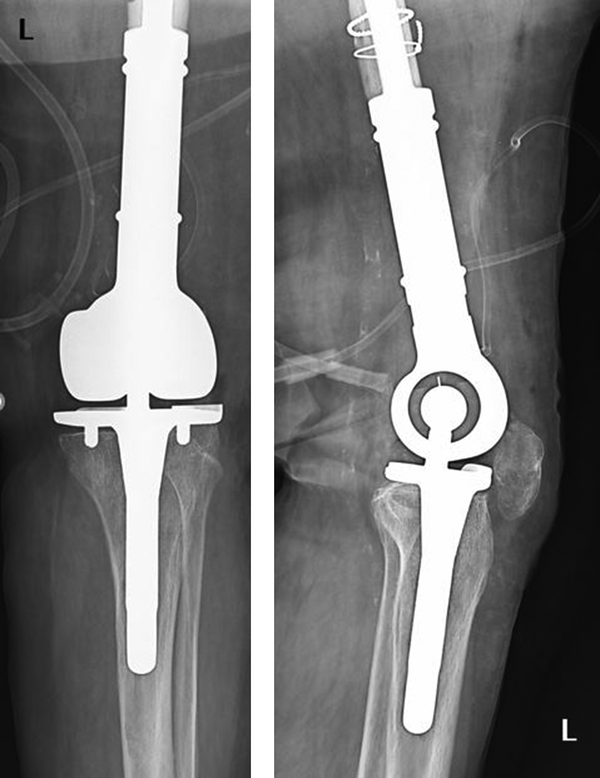 Introduction: Periprosthetic fracture, after total knee arthroplasty, is one of the most common reasons of revision arthroplasty and periprosthetic fracture of the patella has been shown to be very rare. Literature review has shown no reports of periproshtetic fracture of the patella around tumor endoprosthesis. Only 1 study has discussed management of open periprosthetic fractures of the patella as this type of fracture is extremely rare. 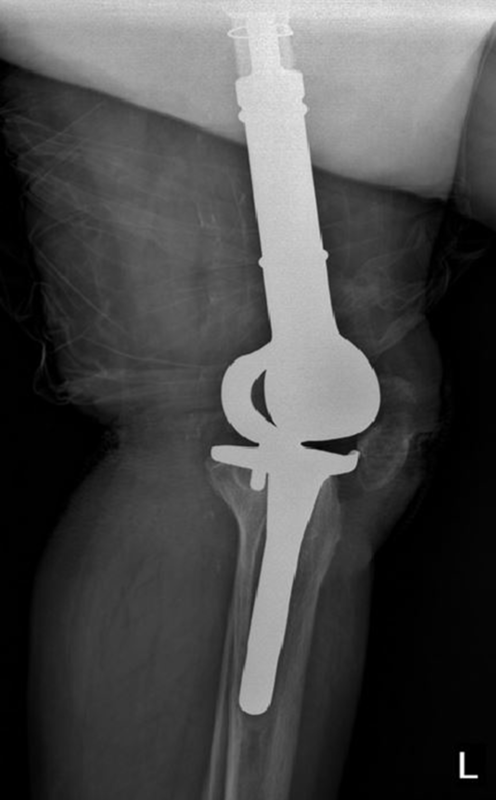 Case Presentation: We report a particular open periprosthetic fracture of the patella around a tumor endoprosthesis in a 60 years old female, that was treated with irrigation and debridement and tension band wiring and 3 month of follow up showed satisfactory range of motion with no extension lag. Conclusions: Despite the fact that operative management of periprosthetic fractures of the patella has a high rate of complications and poor outcome, it can be considered for patients with open periprosthetic fractures of the patella, especially when the extensor mechanism is compromised. Total knee arthroplasty is the best option in treatment of severe degenerative joint disease of the knee, especially in elder patients. Knowing the fact that using this treatment has risen in recent years, the incidence of complications has increased recently. One of the most common complications is preprosthetic fractures, which has been shown to be one the most frequent reasons of post-operative pain of the knee joint and revision arthroplasty, regardless of the type of prosthesis used (1, 2). Preprosthetic fractures can occur in the distal femur, proximal tibia, or the patella (3). The patella has the least prevalence (2). Periprosthetic patellar fracture can happen whether the patella has been resurfaced in the past total knee arthroplasty or not, however, studies have shown that the incidence of preiprosthetic patellar fracture is slightly higher when there is history of patellar resurfacing (1). Incidence of periprosthetic fractures has diminished around mega prosthesis, according to better stem designs and material used in them (4). Patellar periprosthetic fracture has been reported very rare and the incidence after total knee arthroplasty is about 0.5% to 3% (5). There has been no report of periprosthetic patellar fracture around tumor endoprosthesis; we reported a particular case of periprosthetic patellar fracture around knee tumor enoprosthesis in a 60-year-old female with a previous history of distal femoral giant cell tumor. A 60-year-old female, with a history of surgical implantation of a tumor endoprosthesis of the knee, was presented to our emergency room 5 months ago with a 10cm transverse deep wound. The patient had a history of left distal femoral giant cell tumor, which was treated with surgical resection of the tumor, cementing, and plate fixation 20 years ago. In addition the patient had a recurrence of the tumor and fracture of plate and cement 5 months before this recent incidence, in that time she underwent a surgery for plate and cement removal of the distal femur and a tumor endorosthesis was applied in another session in our department using anteromedial approach. Initial (Figure 1) and post-operative (Figure 2) radiographs and follow op radiographs (Figure 3). A total of 5 months after the surgery, while she had no problem in normal daily activities, she fell from the stairs and landed directly on her left knee as it was in hyper flexion and was brought to our hospital. Initial assessment showed a 10 cm deep transverse wound on the anterior of the knee joint on the patella perpendicular to the previous surgical scar and endoprosthesis was exposed (Figure 4). The extensor mechanism of the knee was compromised. Anteroposterior and lateral view radiographs of the knee was performed (Figures 5 and 6) and showed a periprosthetic fracture in superior pole of the patella without any signs of loosening or failure of the endoprosthesis. According to Goldberg et al. the fracture was classified as Type 2 since it involved the extensor mechanism. The patient was evaluated in the Emergency department and received intravenous antibiotics (Cefazoline and Gentamycine) as well as 1 intramuscular shot of Tetabolin and tetanus vaccine. Then, a long leg splint was applied to temporarily immobilize the knee, the patient was transferred to the operation room immediately for irrigation and debridement and the wound was approximated and a bulky dressing was applied. Two days later she underwent another surgery of fixation the patella, we used the previous anteromedial approach scar to expose the joint and patella, the wound was irrigated with 9 liters of irrigation saline by the means of pulse lavage device to ensure no contamination would remain in the wound and every suspicious and nonviable tissue were removed, the endoprosthesis was examined for a mal-function or any signs of loosening or periprosthetic tibial fracture; fortunately it proved us the other way. Since there was no evidence or doubt about periprosthetic joint infection (normal initial ESR, CRP, no sinus tract), we did not send any culture specimen of the wound. Finally, with the tension band wiring technique using a reduction clamp and 2 K-wires, the superior segment was reduced and fixed in place and 2 sternum wires as a figure of 8 were applied. 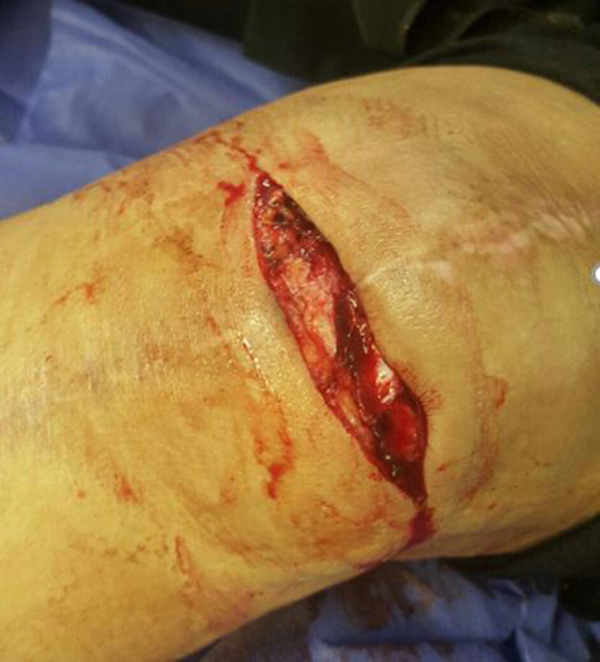 There was no application of a drain and the wound was closed with no skin tension. A knee immobilizer was used and then changed to a hinged knee brace to immobilize the patient. 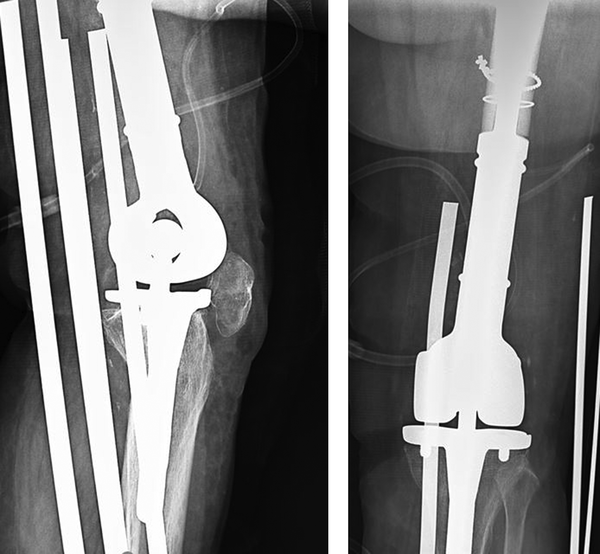 Post-operative radiographs showed satisfactory reduction of the superior pole of the patella with adequate fixation (Figures 7 and 8). We observed the patient in our department for 3 more days and she was discharged with an instruction to remain non-weight bearing for at least 3 more weeks and to not actively extend her knee. We followed the patient for 3 months with weekly visits in the 1st month and every other week for the next 2 months. During that time she didn’t complain of remaining pain, or extension lag, she gained full range of motion and promising active extension following physiotherapy sessions. The most effective way to increase the quality of life among patients with extreme knee osteoarthritis is total knee replacement (1, 2). By the increase in the number of total knee replacement surgeries, the incidence of complications including periprosthetic patellar fracture has increased, which is known to be one of the biggest challenges for even great surgeons (1, 3). Incidence of periprosthetic patellar fracture after total knee replacement in cases with resurfacing of the patella has been reported between 0.2% to 21% and in non-resurfacing cases about 0.05%. The reported periprosthetic patellar fracture has different values in numbers in studies and this could be due to following reasons: 1-duration of follow up in different studies, 2-implant design, 3- patient population, and 4-surgical technique including the approach and whether to do resurfacing or not (6, 7). Most of the fractures happen in the first year after the knee replacement surgery (6), many of them happen in the elderly that can suggest stress fracture due to osteonecrosis (8), and most of them are seen on the follow op radiographs incidentally (6). The prevalence of the fracture is more likely in females (9) as well as when there is a history of patellar resurfacing (10). Open periprosthetic patellar fracture is a very rare condition and there are only 2 case reports on that, the 1st one is a case report from Cuulotta et al. in which an open patellar fracture due to a knee dislocation after a total knee arthroplasty (TKA) occurs and is fixed with tension band wiring (TBW) technique (11). The 2nd case that was reported by (3) in 2016 is about a 56-year-old female with an open periprosthetic patellar fracture due to falling, which was fixed with TBW. In one study, the prevalence of patellar fracture after TKA was 1.14% and the mean time of incidence after TKA was 17.5 months; 35.3% of fractures were transverse and 11.7% were comminuted, 29.5% of fractures were vertical and 23.5% were avulsion fractures, from all these fractures 76.5% were with displacement; 69% of fractures were seen in the first year of follow up and 53% were asymptomatic and were found incidentally in follow-up radiographs; it was noted that the mean age of the patients was 71 (9). There are 2 known etiologies of periprosthetic fractures of the patella in different studies, the 1st one is a stress fracture due to osteonecrosis and the 2nd one is trauma, which is less common (3, 6). In a study performed by Chalidis et al. 88.3% of all patellar fractures after TKA were due to a factor other than trauma and were detected in routine follow-up radiographs (1). It was also noted in another study (9) that patellar fractures after TKA were with sclerosis and fragmentation in 23.5% of cases, which is a sign of osteonecrosis; 17.6% of cases in this study had quadriceps tendon rupture as well. 1-rotational malalignment of tibial or femoral components: it is well known that femoral malalignment can cause an increasing eccentric load on the patellofemoral joint and can sub lux the patella and increase the risk of patellar fracture, 2-malalignment of patellofemoral, 3- excessive patellar resurfacing (more than 15 millimeter), minimal or asymmetrical resurfacing of the patella, 4- devascularizing the patella, especially in anteromedial approach or in cases of lateral release of retinaculum due to iatrogenic damage to medial and suprapatellar genicular arteries, 5- some kind of prosthesis like large peg implant, 6- PCL-substituting implants, 7-rheumatoid arthritis and long term use of steroids due to the increased risk of osteopenia, 8- osteonecrosis due to sever increase in temperature in bone cement polymerization process, 9- revision arthroplasty, 10- osteoporosis and bone loss, and 11-knee hyper flexion (3, 6, 12). In cases of using megaprosthesis, regarding their indications and patients conditions, some risk factors can be added to the above-mentioned list: the 1st one is post-operative irradiation and chemotherapy that can both cause bone weakness and increase risk of fracture and the 2nd cause may be the extensive tumor resection, which can lower the soft tissue support and lead to extensor mechanism damage and muscle weakness, which may result in higher patellar fracture risk (13). The above-mentioned factors may lead to periprosthetic fracture after a minor trauma or repetitive cyclic loading after daily activities (14). Goldberg et al. has described patellar periprosthetic fractures in 4 different types (15); type 1 includes fractures of the peripheral parts of patella, which do not compromise the extensor mechanism; the 2nd type are fractures, which disrupt extensor mechanism or implant bone composite; the 3rd type is fracture of the distal pole of the patella with (subtype A) or without (subtype B) rupture in patellar ligament; type 4 are fractures with association of patellofemoral dislocations. In this case, the report regarding the disruption of extensor mechanism the fracture is classified as type 2 Goldberg, although, there is no specific classification for patellar fractures around tumor endoprosthesis. Management of periprosthetic patellar fractures were always a matter of debate and a zone of challenge for most of the surgeons as they associate with many unpredictable complications, especially when there is an associated implant loosening or sever displacement of the fracture (3); in the management of these specific fractures, one should always consider following factors: the amount of displacement, extensor mechanism function, patellar implant stability, and bone stock (16). In a study performed by Chalidis et al. (1) it was clarified that 92% of open reductions and internal fixations were lead to failure. Surgical complications were up to 39% in another study (17). These devastating results have led to confirmation of non-operative management of periprosthetic patellar fractures in cases in which the extensor mechanism is intact and the fracture is minimally displaced and the prosthesis is stable (3, 15). Main reasons to be named in failure of ORIF in this fracture include fracture hematoma evacuation and trauma to vascular network around the patella after previous TKA, it can also be noted that poor bone stock in the elderly is another cause of osteonecrosis and stress fracture and increases operative failure rate (3), the other important reason is post-operative deep wound infection, which is high in rate (18). However, if the patellar component is not stable, the patient will undergo the operation, which in this situation the decision is made based on the patient bone stock. It has also beennoted that due to the high rate of surgical complications, the non-surgical treatment, in cases with instability of patellar component, which have mild symptoms and their knee function is good, can be considered (15, 19). In case of extensor mechanism impairment with sever displacement of the fracture, quadriceps tendon or patellar ligament repair and ORIF of fractured pieces, especially in younger patients with better bone stock, is preferred, considering the fact that special care should be taken to avoid wound infection (2, 3). In one study (16), an algorithm in management of periprosthetic patellar fractures was introduced, which seems to be logical and countable. 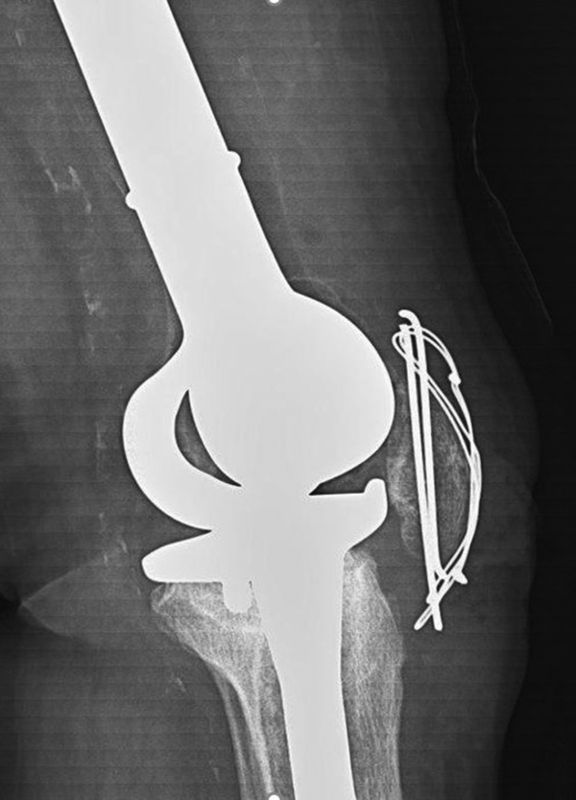 In this case we presented here, a patient with a displaced open fracture with impaired extensor mechanism was managed by surgical treatment and since there was no patellar component used in previous surgeries, using TBW and ORIF of the fracture seemed to be a rational choice. Although previous studies emphasize on non-operative treatment of periprosthetic patellar fractures, it seems that in cases with impairment of extensor mechanism, and those with open fractures considering the high risk of post-operative wound infection, surgical treatment, and when possible ORIF of the fracture in selected cases can be preferable, however, further studies are needed to prove this statement. 1. Chalidis BE, Tsiridis E, Tragas AA, Stavrou Z, Giannoudis PV. Management of periprosthetic patellar fractures. A systematic review of literature. Injury. 2007;38(6):714-24. doi: 10.1016/j.injury.2007.02.054. [PubMed: 17477924]. 2. Yoo JD, Kim NK. 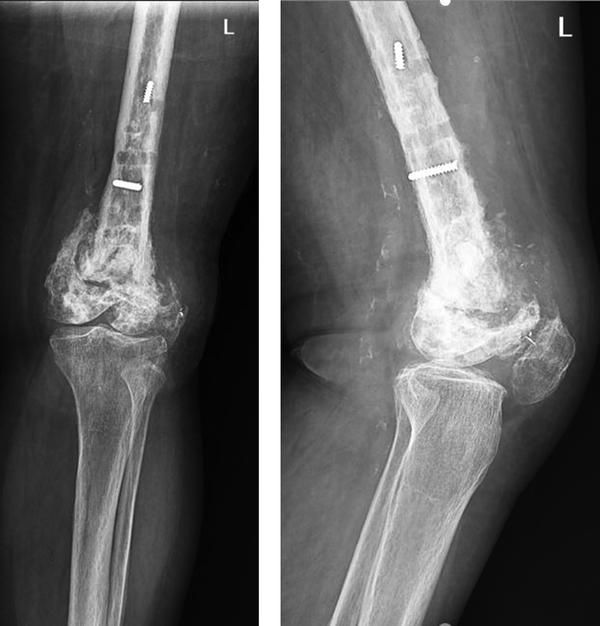 Periprosthetic fractures following total knee arthroplasty. Knee Surg Relat Res. 2015;27(1):1-9. doi: 10.5792/ksrr.2015.27.1.1. [PubMed: 25750888]. 3. Masmoudi K, Grissa Y, Benzarti S, Cheikhrouhou H, Mensi Z. 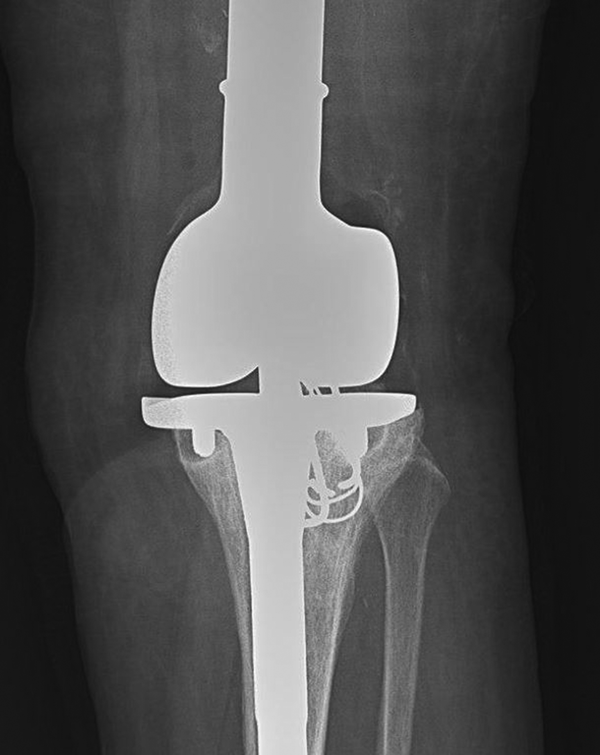 Open Periprosthetic Patellar Fracture after Total Knee Replacement. J Orthop Case Rep. 2016;6(2):89-91. doi: 10.13107/jocr.2250-0685.452. [PubMed: 27703946]. 4. Palumbo BT, Henderson ER, Groundland JS, Cheong D, Pala E, Letson GD. Advances in segmental endoprosthetic reconstruction for extremity tumors: a review of contemporary designs and techniques. Cancer Control. 2011;18(3):160-70. doi: 10.1177/107327481101800303. [PubMed: 21666578]. 5. Sheth NP, Pedowitz DI, Lonner JH. Periprosthetic patellar fractures. J Bone Joint Surg Am. 2007;89(10):2285-96. doi: 10.2106/JBJS.G.00132. [PubMed: 17908909]. 6. Berry DJ. Patellar fracture following total knee arthroplasty. J Knee Surg. 2003;16(4):236-41. [PubMed: 14584838]. 7. Berry DJ. Epidemiology: hip and knee. Orthop Clin North Am. 1999;30(2):183-90. [PubMed: 10196420]. 8. Brick GW, Scott RD. The patellofemoral component of total knee arthroplasty. Clin Orthop Relat Res. 1988;(231):163-78. [PubMed: 3286074]. 9. Chun KA, Ohashi K, Bennett DL, El-Khoury GY. Patellar fractures after total knee replacement. AJR Am J Roentgenol. 2005;185(3):655-60. doi: 10.2214/ajr.185.3.01850655. [PubMed: 16120913]. 10. Burnett RS, Bourne RB. Periprosthetic fractures of the tibia and patella in total knee arthroplasty. Instr Course Lect. 2004;53:217-35. [PubMed: 15116616]. 11. Gulotta LV, Gardner MJ, Rose HA, Helfet DL, Lorich DG. Periprosthetic patellar fracture after an open knee dislocation. Clin Orthop Relat Res. 2005;(436):265-9. [PubMed: 15995451]. 12. Bourne RB. Fractures of the patella after total knee replacement. Orthop Clin North Am. 1999;30(2):287-91. [PubMed: 10196430]. 13. Jones KB, Ferguson PC, Deheshi B, Riad S, Griffin A, Bell RS. Complete femoral nerve resection with soft tissue sarcoma: functional outcomes. Ann Surg Oncol. 2010;17(2):401-6. doi: 10.1245/s10434-009-0745-5. [PubMed: 19841985]. 14. Savvidou OD, Sakellariou VI, Megaloikonomos PD, Mavrogenis AF, Papagelopoulos PJ. Periprosthetic Fractures in Megaprostheses: Algorithmic Approach to Treatment. Orthopedics. 2017;40(3):e387-94. doi: 10.3928/01477447-20170117-07. [PubMed: 28112789]. 15. Goldberg VM, Figgie H3, Inglis AE, Figgie MP, Sobel M, Kelly M. Patellar fracture type and prognosis in condylar total knee arthroplasty. Clin Orthop Relat Res. 1988;(236):115-22. [PubMed: 3180562]. 16. Sarmah SS, Patel S, Reading G, El-Husseiny M, Douglas S, Haddad FS. Periprosthetic fractures around total knee arthroplasty. Ann R Coll Surg Engl. 2012;94(5):302-7. doi: 10.1308/003588412X13171221592537. [PubMed: 22943223]. 17. Ortiguera CJ, Berry DJ. Patellar fracture after total knee arthroplasty. J Bone Joint Surg Am. 2002;84-A(4):532-40. [PubMed: 11940611]. 18. Keating EM, Haas G, Meding JB. Patella fracture after post total knee replacements. Clin Orthop Relat Res. 2003;(416):93-7. doi: 10.1097/01.blo.0000092992.90435.20. [PubMed: 14646745]. 19. Dennis DA. 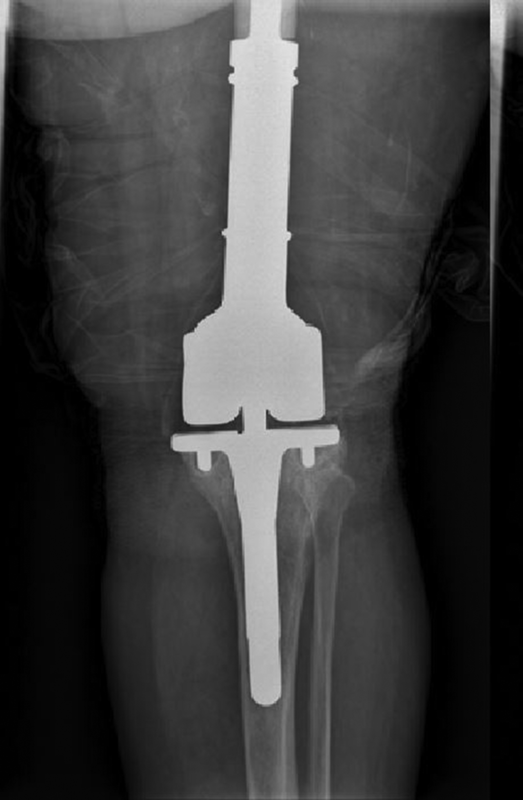 Periprosthetic fractures following total knee arthroplasty. Instr Course Lect. 2001;50:379-89. [PubMed: 11372337].